Tell me what you don't understand, maybe I can help? for ex. :3+4~u~D/B+3 but what is this jgl? i don't understand it...and also b~f+3+4 why b before of f+3+4? and is there a means after f+3+4 with wich yoshi is more fast to lift up? I'm actually not sure what you mean by all. By the time you get good at moving around on the map, using stair-stepping (b,b,d,b.. etc.) and other techniques, you often come across times where you have to input something first before executing the actual command. - You wanna lure your opponent into a b+1+2, and hence backdash a few times to lure him towards you. - Now the time comes to use b+1+2, and your latest command was "b". - Since b,b+1+2 gives another move than b+1+2, you then press f~b+1+2, so that the game doesn't think the last "b" was part of b+1+2. - After pressing f~b+1+2 yoshi now makes the actual move you had in mind instead of b,b+1+2. So sometimes, you have to press the opposite direction in order to make the actual move you wanted to (u~d_f~b etc.). This topic has been silent for too long, so i'm popping a question now. Okizeme - one of my favorite aspects of Tekken - and it often requires good reflexes, even sometimes it's pure intuition. Such is my experience. A typical count of wake-up prevents from me is typically two - sometimes three. And i really wanna improove. Furthermore - i'd say that oki with Yoshi - such as luring your opponent into a trap, hurting him for a good 50-60 damage from a launcher, or keeping your okizeme options at a max is a must! I hardly ever use any juggle enders, and i like to experiment with new okizeme tricks. Halve the guaranteed damage from a juggle to take a risk with okizeme is what i perfeer. Now - i'd like to hear from you how you build up your okizeme. How you get a good, solid okizeme going. 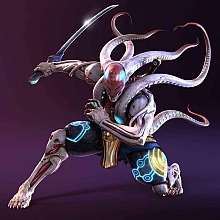 Not only with Yoshimitsu - but with all characters! So - flame away, guys n' gals! can someone please tell me what an okizemi is? Im sorry to be such a noob, but the lingo you use here is just so confusing. Exacto - Okizeme means to keep your opponent grounded etc. Whta a funny. I had no idea what it meant till now, thanks! I don't have any solid oki tactics as of today, but I usually do a d+1, dash forward then d/b+3,3...,4 on grounded opps. Sometimes if my u+3+4 connects, I'll follow up with u/f+3+4, then a FLE, then f+3+4, roll forward then 3, then d+1. I also sometimes use DGF+3 or FC,d/f+3 or FC,d/f+1 to keep them grounded. Then on rolling opps I sometimes use f,f+4 or d/f+3 (sometimes d/f+3 yields the opp on standing position). Haha. I am never EVER EVER going to be able to understand and use these tactics.